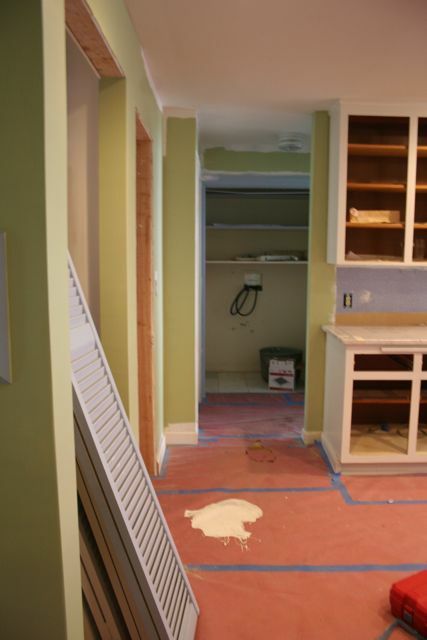 In the grand scheme of home renovation, any small step forward is at least a step FORWARD. So this make-over for our laundry room, while not massive in scale, makes me feel as though we’re getting a toe-hold around here. Naturally, I didn’t take any great “before” photos, when it was full of the previous owner’s JUNK. I mean, truly: every empty and half-empty bottle imaginable, shoved to the very back of 24″ deep shelves, in a dark, dreary cupboard by the back door, and making the entire kitchen gloomier by extension. But here at least you can see what we were up against: country blue gloss trim, bi-fold doors in every direction, and very little natural light. We opened up the kitchen, got rid of a wall, and painted everything in sight, but the folding doors and trim in the laundry refused to budge, and something had to be done. When we first moved in, this is what we had: a deep recess next to the garage door, tucked into a little nook that also leads to the guest bedroom (which our oldest child now has for her own little teen retreat/nest, off at the opposite end of the house from the rest of us, so she can listen to her rock-and-roll music). One overhead light, with no globe on the fixture. 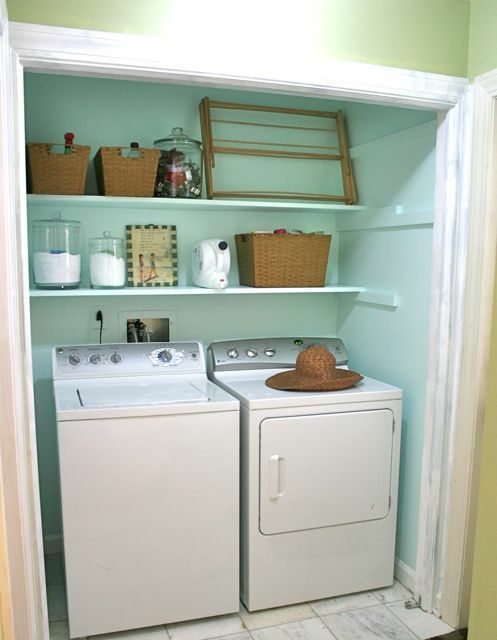 Deep shelves–really, I’m not exaggerating about the 24″ deep shelves, and three of them, all the way to the ceiling inside this laundry nook, which can be concealed behind country blue bi-fold doors. Should you be able to live with yourself knowing you have country blue bi-fold doors in your home, that is. Now, I know you think I’m being really weird and getting worked up about these deep shelves–deep is better, right? Because there’s more room for storage? Wrong. Here’s what happens when you have deep shelves: you put crap on them. And if you’re the previous owner of this house, you put LOTS of crap on them. And if you’re us, and the day you move in it pours down sheets of freezing cold rain, you stick things in there because you don’t know what else to do with them. And then you forget what’s in there, and can’t find anything for six months. 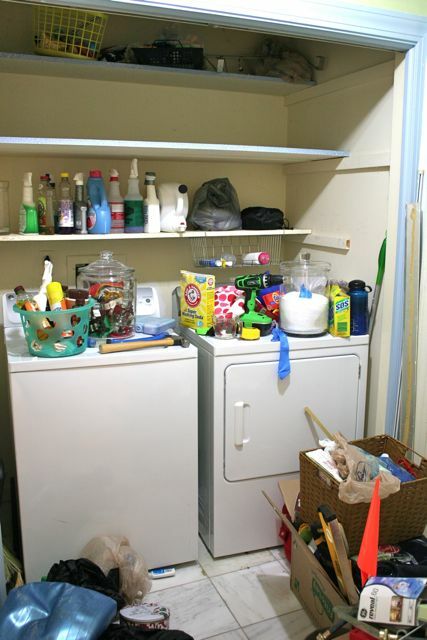 Deep shelves are the compost in which clutter grows, and they ought to be eliminated. These particular shelves are actually TWO boards, each 11.5″ wide, and supported by 1x2s nailed to the walls. Classy, yes? But at least this arrangement made them easier to remediate. Here we are, halfway through my prep-work, the day I realized I couldn’t take it any longer and Something Had To Be Done. Naturally, I got half the junk off the shelves before I thought to take a picture–and yes, everything you see on the floor there was on those shelves previously (including the exercise ball). I’ve also already removed one of the lowest shelves–see how it’s shallow, and the middle shelf above it is deep? They were both that deep before, and full of….who knows what. And already, there is SO much more light coming in. No thanks to the fact that the shelves were covered in the same country blue mini-floral wallpaper that used to grace the kitchen walls. It’s just all so circa 1986. And here’s the same view after. Nothing fancy here–just a little paint and some sweat equity. I removed the front shelf from the middle and lower level, and took out the highest shelf altogether–who’s really going to get anything from up that high, really? Plus, my glass jars didn’t fit under that shelf, and it was just easier to get rid of it. 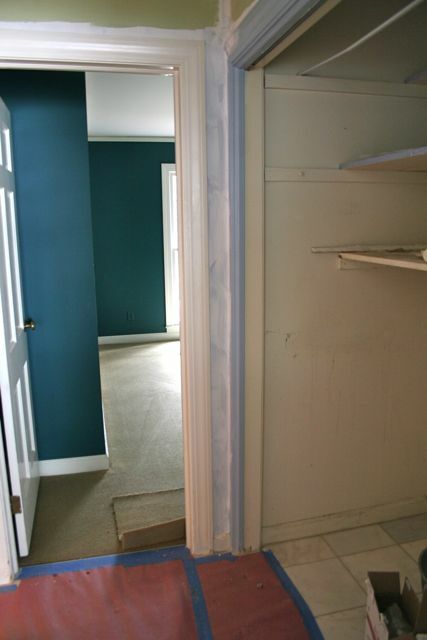 The color is Valspar Ice Blue, which is the same as what we used in our son’s room on the ceiling, and is one step up the color card from what we used in the master bedroom. It’s also the color that we’ll do the master bath (someday) and what I plan to use to paint the ceiling in the sunroom, Southern front porch-style. Because the center shelf was also a little low for the glass jar lids, I picked up two 24″ 1x2s at Lowe’s and used finishing nails to attach them above the weird rail/shelf support in the center. This had the added advantage of making a kind of step that disguises the fact that those supports are of random and unmatched lengths, and don’t make a ton of sense here. Everything got painted, all the way to the ceiling. 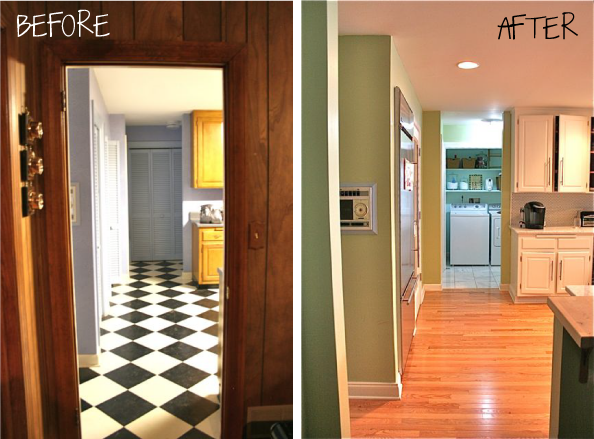 Don’t under-estimate the power of painting the ceiling in a teeny room! When the walls and ceiling match, the whole space opens up–which we learned on our last laundry room (the project that, I am convinced, finally sold our old house after four years on the market). The jars are from Home Goods, and I love not only the clean look they give, but the functionality. 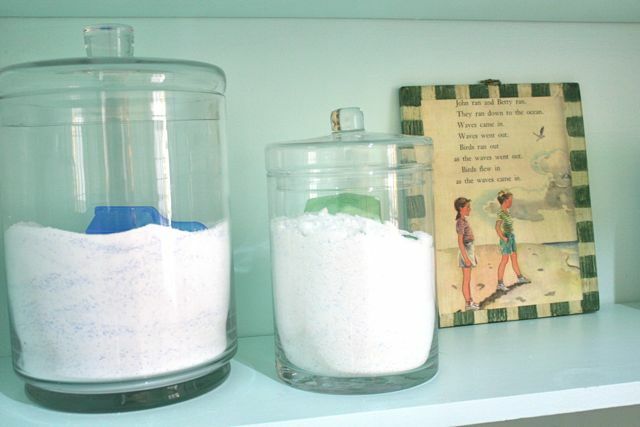 One holds OxiClean and the other holds powdered detergent (we usually use liquid, but Martha says you ought to vary the detergent based on the stain or laundry task). The shelves are now high enough to make it easy to lift the lids and scoop out, and the art (an Etsy find from two years ago) continues the accidental beachy theme we’re developing in this part of the house. The living room is clean and crisp and mod, but the den/kitchen/sunroom/laundry is feeling like a modern beach house–not in a cottagey way, but in the colors and the textures. I really love how it’s finally beginning to come together! 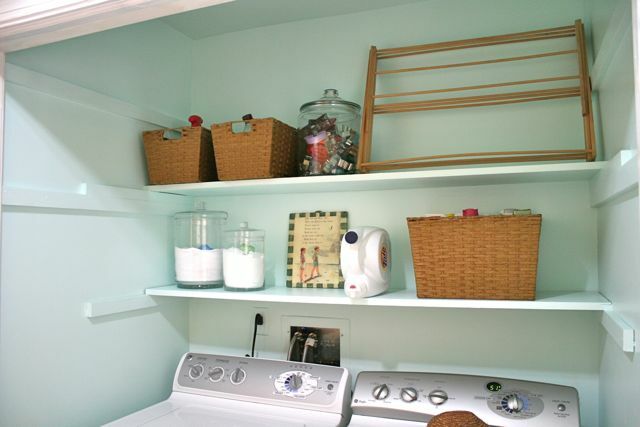 I love to use baskets to hide my other cleaning supplies, like sprays and toilet cleaners. That way, they’re away from where the children could accidentally get into them, but I don’t have to SEE them all the time. This nested set comes from TJ Maxx? Target? One of those. The accordian-style drying rack I had hoped to mount to the wall, but I can’t figure out how to do that and have it collapse again–what I really want is something that I can pull out of the wall when I need it, so that things hang to dry over the dryer and benefit from the warm air coming up, but that will tuck more-or-less flat to the wall when I don’t need it. Still hunting. Perhaps not Earth-shaking from a home improvement stand-point, but this was a great weekend project for while my husband was out of town, something to cheer the house up and surprise him with. The bi-fold doors are gone forever, and the whole laundry will stay visible from the den, picking up that blue shade and bringing it into the rest of this side of the house. Plus, it’s so much easier to do laundry in a place that isn’t ugly and depressing. How about you? What’s the last place you painted that seemed insignificant, but had a super giant impact on you when you finished? I’m trying to get up the motivation to paint the master bath–maybe you all can inspire me! ← Skirting the Issue: Sewing for Foster Girls this Saturday at Whipstitch! well done! 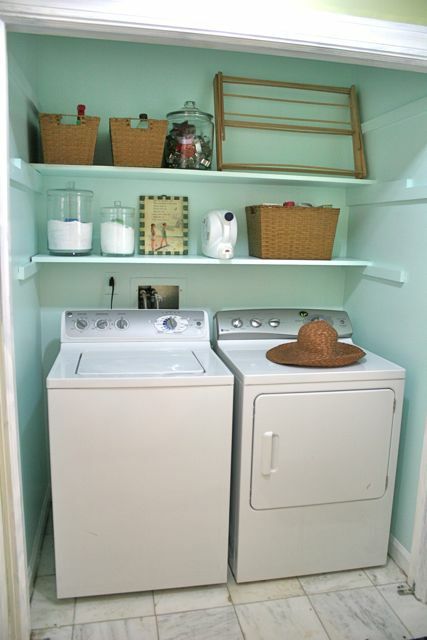 what a nice, clean-feeling space … which is what you want from a laundry room, anyway, right? they carry wall-mounted drying racks at the container store … perhaps one of them would work for your space! So much cleaner and brighter! Looks great. I really want to paint the inside of our linen cupboard and pantry – they are both dark wood and so dreary-looking. I’m the only person that really looks at them, but I think it would make me so much happier. Have you seen the drying racks from Ballard Designs? I don’t have one, but they caught my eye a whole ago because I thought it was such a great idea. Sounds like what you want. Did you look at IKEA for a wall mounted rack? Seems like I’ve seen one there before. As mary ella mentioned, i was going to mention Ballard’s. They actualy have two different versions and multiple sizes. And you can get them at a fraction of the catalog price at the scratch & dent outlet which, by the by, is mere minutes from your house! When i was there last week (scoring an $800 rug for $200!) They had the drying racks on sale for $29. Woot. Yes! And I’m on the hunt for a rug for the den, so we can kill two birds, so to speak. Might do Pottery Barn outlet today–I know they have a rug I love, just need to see if I can get the right size–and might could hit Ballard on the way back. BTW, any time I hear or read Ballard, I always think of you and your kitchen set! I’m assuming the Holcomb Bridge location is the scratch & dent, not the DeFoor Ave? Might have to go to both! Holcomb Bridge is all outlet. Defoor is smaller and half outlet, half full price. Really gorgeous Deborah. 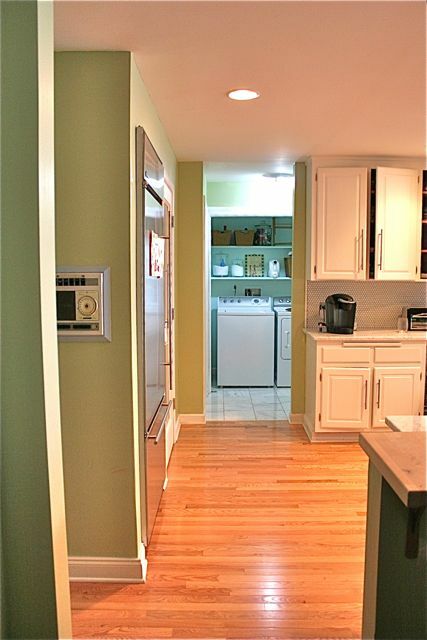 Love what you have done with the Laundry and Kitchen too. The Ballard Racks look great but you can also do what the hotels do and have the extendable line go from on wall to the other. You just pull it out and hook it into the socket on the other wall. Not sure if this is clear. You could have two or three of those parallel. They are not bulky. Just wrote you an email a couple of days ago regarding the Pants course.